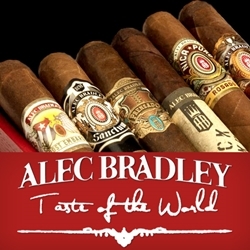 The Alec Bradley Taste of the World Cigar Sampler is an excellent selection of the finest hand-made premium cigars the company has to offer. Packaged elegantly in a box of 6, and presented in the Toro size, each cigar in this collection has a 90+ rating due to the perfectly aged tobaccos that have been hand crafted individually from Nicaragua, Honduras, Panama, Colombia, and the Sumatra regions. This cigar sampler is an easy and inexpensive way to try a variety of different styles of the Alec Bradley collection, offered here at a great discount price. This hand-rolled premium cigar sampler makes a great gift for a friend or loved one, pick one up today. Call us here at Smokers Discounts for more details!